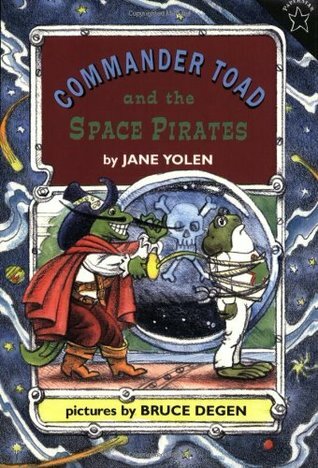 We stumbled upon the Commander Toad books at the library a few years ago, and have checked them out several times since. 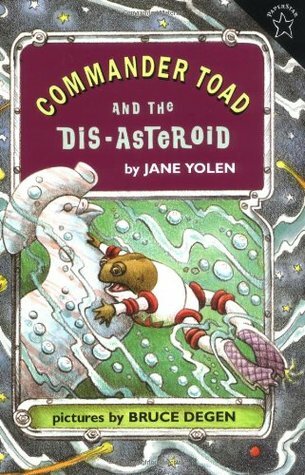 They are written by Jane Yolen and illustrated by Bruce Degen. They are Easy Readers, geared for readers transitioning from the simple easy reader books to full chapter books. Each book in the series is around 65 pages long, with an illustration and 2-4 sentences per page. I am still reading them out loud to my 1st grader, more for length than vocabulary, but my 3rd grader can zip through them on his own no problem. 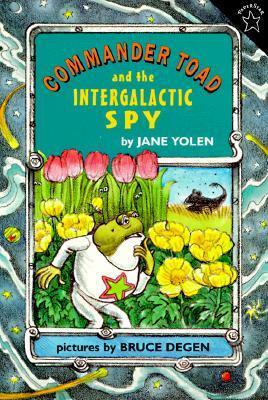 Commander Toad: Captain of the spaceship Star Warts. Brave and bright, bright and brave. The hero of the fleet. Mr Hop: Copilot and deep thinker. Code breaker. Lieutenant Lily: Engine fixer and tinkerer. Also, the best shot with a ray gun. Jake Skyjumper: Computer master and navigator. Doc Peeper: Ship doctor. Wears a grass green wig. "To find planets. To explore galaxies. To bring a little bit of Earth out to the alien stars." Together the intrepid crew handles the seen and the unforeseen, usually while cracking bad jokes and making atrocious puns. My kids think they're hilarious. There are many sly references to movies that you may have to explain as you read. p.s. You don't have to be a Star Wars buff to enjoy these! Meet Commander Toad and his faithful crew! They discover a new planet that is only water. Upon landing, they have a very large monster named Deep Wader to contend with! Will they make it back to their beloved ship? When the Star Warts find a new planet, they have to go down and check it out, of course. Lieutenant Lily is allergic to something on the planet, but other than that it seems safe enough. That is...until little bunches of grape-like things pop up out of nowhere, and keep expanding. Commander Toad gets swallowed up by one completely! Who will rescue him from the grapes? 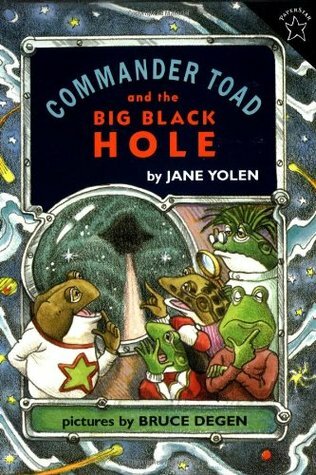 "Commander Toad and his crew on the Star Warts come across a black hole while leapfrogging across the galaxy. 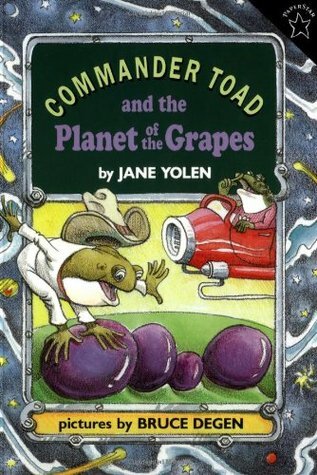 Something long, pink, and sticky grabs their spaceship and it isn't space gum--it's the tongue of an E. T. T - an Extra Terrestrial Toad! When all else fails, Commander Toad has to resort to a secret weapon from his past to save the ship from toad-al destruction." Star Fleet sends the Star Warts on a special mission, in response to an SOS from an asteroid: "Beans swell. Beans bad." They arrive at the asteroid to find pigeons circling over endless water. There's a language barrier to overcome, but if anyone can do it, they can! They must get to the bottom of the bean problem--literally--so their weary pigeon friends will have a place to land. 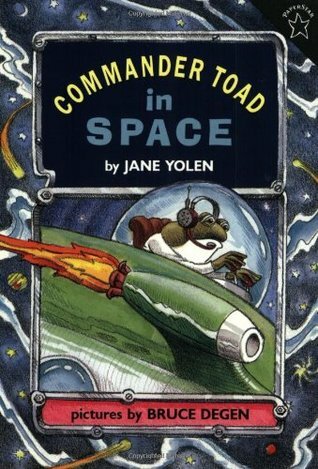 Once again, the Star Warts has a special mission: they must go down to a planet and rescue Space Fleet's greatest spy: Agent 007 1/2, the famous Tip Toad, who also happens to be Commander Toad's cousin. Commander Toad is confident that he will recognize his cousin, no matter what disguise he has on, but when they land he is not so sure. "It's been a long trip, and Commander Toad and the crew of the Star Warts are bored. They've played all the games and watched all the movies and read all the books on the ship. Suddenly the alarm goes off--pirates are coming aboard, led by Commander Salamander, Scourge of the Skies and Goon of the Galaxies. Is the crew going to have to play his favorite game--Hop the Plank?" 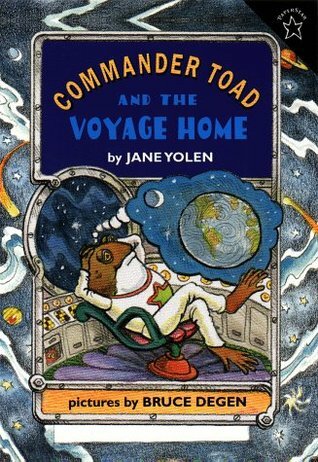 Commander Toad and his crew are ready to go back to Earth and spend some time at home, but when they type H-O-M-E into the navigation panel, Earth is not where they are sent. What is this planet of swirling water (and one green patch?) And what could be in that hole that the Commander just tripped and fell into? I'm happy that there are a few we haven't read yet! I'm going to see if our library has them, or will order them. Have you ever read these? What other transitional Easy Reader series do you know about?